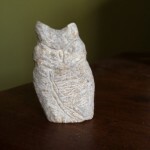 Soapstone owl. Is it Michaelangelo? No. Does it make me happy? Yes. I am creative every day, but sometimes I still feel like what I do doesn’t ‘count’ as creative. Why? Because it’s not formal enough, didn’t take long enough, or wouldn’t be able to sell. But that is not my motivation for doing creative things. I create because it nurtures me and is part of who I am. I believe that everyone is creative. Maybe you don’t believe it, maybe you are one of those people who thinks ‘I can’t draw a straight line with a ruler!’ Is that really a thing? Somehow in order to be able to make things you have to pass the ‘Can you draw a straight line with a ruler?’ test? I believe that if you don’t think that you are creative, you probably haven’t found your arena yet. Or, you are too afraid to try something new. Sometimes it is just easier to do what ‘needs’ to be done, because it is very clearcut. You know how to do the laundry, so that doesn’t take a lot of thought. And it needs to be done anyway. So, you might as well do it- right? And by the time all of those things that need to be done are finished, you don’t have any time to be creative. 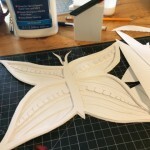 Paper butterfly I made during my Thursday evening creative time. Screw that! Make time for yourself! Even if there is no reason for it other than it will make you happy. Make it a habit. Decide on a specific time of day or day of the week and COMMIT. Even if you know that there may be some exceptions to your commitment- it is easier to commit to a time then to make the decision at the end of a long day with a tired brain when your decision making skills are at their lowest. 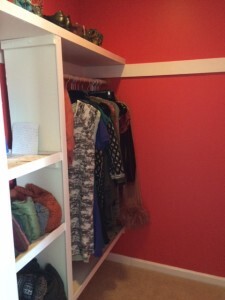 My new closet. It used to be white with wire shelves. This pink color is just AWESOME. See your creativity in unexpected places. Recognize when you have been creative and give yourself some credit. Did you make a delicious dinner that was something new for you? Boom. Did you put up photos or reorganize a room? Yes. These are creative acts. Celebrate them and yourself for doing something creative. Eventually you might want to level up. Maybe you have been thinking about trying your hand a painting. Or pottery. Now just might be the time for that.